1) the role of Pax6 in mouse eye development, in particular in the identification of Pax6 regulated genes. To this end we are using Pax6 deficient mice (Sey) as well as transgenic mice overexpressing Pax6. 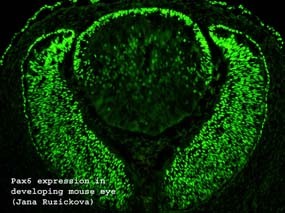 2) genes that control early steps of mouse eye development and modify function of Pax6. A combination of gain-of-function (transgenic) and loss-of-function (conditional knock-outs) approaches are used. 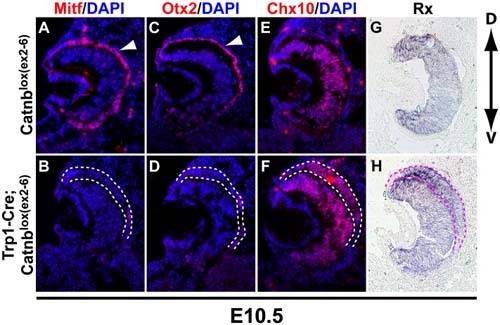 Wnt/beta-catenin signaling is highly active in the dorsal retinal pigment epithelium (RPE) during eye development. To study the role of Wnt/beta-catenin signaling in the RPE development we used a conditional Cre/loxP system in mice to inactivate or ectopically activate Wnt/beta-catenin signaling in the RPE. Inactivation of Wnt/beta-catenin signaling results in transdifferentiation of RPE to neural retina (NR) as documented by downregulation of RPE-specific markers Mitf and Otx2 and ectopic expression of NR-specific markers Chx10 and Rx, respectively. In contrast, ectopic activation of Wnt/beta-catenin signaling results in the disruption of the RPE patterning, indicating that precise spatial and temporal regulation of Wnt/beta-catenin signaling is required for normal RPE development. Using chromatin immunoprecipitation (ChIP) and reporter gene assays we provide evidence that Otx2 and RPE-specific isoform of Mitf, Mitf-H, are direct transcriptional targets of Wnt/beta-catenin signaling. Combined, our data suggest that Wnt/beta-catenin signaling plays an essential role in development of RPE by maintaining or inducing expression of Mitf and Otx2. Conditional inactivation of Wnt/β-catenin signaling results in transdifferentiation of RPE to NR. β-catenin plays a key role in cadherin-mediated cell adhesion as well as in canonical Wnt signalling. 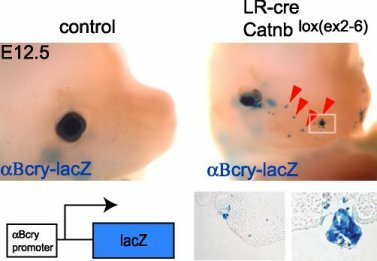 To study the role of β-catenin during eye development, we used conditional Cre/loxP system in mouse to inactivate β-catenin in developing lens and retina. Inactivation of β-catenin does not suppress lens fate, but instead results in abnormal morphogenesis of the lens. Using BAT-gal reporter mice, we show that β-catenin-mediated Wnt signalling is notably absent from lens and neuroretina throughout eye development. The observed defect is therefore likely due to the cytoskeletal role of β-catenin, and is accompanied by impaired epithelial cell adhesion. In contrast, inactivation of β-catenin in the nasal ectoderm, an area with active Wnt signaling, results in formation of crystallin-positive ectopic lentoid bodies. These data suggest that, outside of the normal lens, β-catenin functions as a coactivator of canonical Wnt signalling to suppress lens fate.